Pinetop Perkins: At 95, A Grammy Nominee This year's oldest Grammy nominee is Delta blues pianist Pinetop Perkins. He's played with the likes of Sonny Boy Williamson and Muddy Waters. He says he even performed for a U.S. president at the White House — though at 95, he can't remember which one. Pianist Pinetop Perkins was an ideal sideman for blues heroes Muddy Waters, Robert Nighthawk and Sonny Boy Williamson. And he's played everywhere, from Arkansas juke joints and Chicago blues dens to the White House. "I played there before with Muddy Waters," Perkins says. "I can't remember the name [of the president]. Since I got older, I am so forgetful of the names." At 95, Joe Willie "Pinetop" Perkins may not remember the name of President Jimmy Carter, but at the piano, he can still beat out a rollicking boogie. 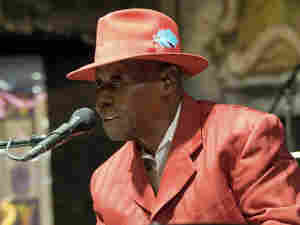 His album Pinetop Perkins and Friends is one of five nominees for Best Traditional Blues Album at the 2009 Grammy Awards. The Grammys are often contests for young talent, but this year, Perkins — the year's oldest Grammy nominee — is one to watch. It's not just a sentimental choice; on the album, Perkins collaborates with fellow blues veteran B.B. King on guitar. "I'm a little older than [King], though," Perkins says. "He's still in the 80s; I'm in the 90s. I'm 95." Perkins' story runs like pure blues legend. He used to play guitar in juke joints. Then, in what he insists was a case of mistaken identity, a dancer attacked him and stabbed his left arm. As a third-grader, he ran away from home, never having learned to read books or music. He's still a chain smoker. And he doesn't flinch when describing how, as a kid, he was beaten with a piece of stove wood. "Just getting out of second grade into third, my grandmother run me away from home," Perkins says. "Knocked me out. When I came to, she was still beating me with a stick of stove wood. I left there, didn't go back. I came up in the world the hard way, man." Perkins picked up the blues purely by ear. As a young man, he got a job backing up harmonica legend Sonny Boy Williamson. They played together for a long-running radio show called King Biscuit Time. Perkins says he realized back then that he had a gift: He could hear in his mind where the music was headed before it actually happened. Before the other musicians heard them, he says, he could hear the chords and imagine the harmonies. "I can hear that stuff coming to me before it gets to me, and do it to it," he says. "It comes in my mind. Can hear the changes coming before they get to me. 'How you do that? You don't read it?' No, I don't read that stuff. No! I didn't get no schoolin.'"